Ron Rollet, Mark Garland, Paige Cunningham. A group of current and past members of our Monarch study team are joining together for the fourth consecutive year to raise funds for the Monarch Monitoring Project in the World Series of Birding. The annual event, sponsored by the NJ Audubon Society, is a fun way for teams to raise funds for important conservation and environmental education efforts. Our team, which we call the "Monarchists," competes in the "No Carbon Footprint" and "Cape Island" categories. On Saturday, May 11, we will travel around Cape Island by bicycle and foot to see how many species of birds we can find. As butterfly researchers, we also keep track of the number of butterfly species we find. Sponsors pledge to contribute a given amount for each species we find. Some choose to just contribute a flat amount. Last year the conditions were great and our team tallied 155 species of birds and 14 species of butterflies, winning the coveted "Cape Island Cup," held by team captain Louise Zemaitis in the photo above. In 2011 we faced a cool and cloudy day with very few migrant birds around, and we found just 115 species of birds and 5 species of butterflies; in 2010, our first attempt in these categories, conditions were a little bit better and that year's totals were 127 species of birds and 14 species of butterflies. How well do you think we can do this year? Make a pledge and guess the right number of birds and we'll send you one of our monarch butterfly magnets. Ready to help out? To make a pledge, just send an e-mail message to team member Mark Garland at mgnature@me.com. If you are ready to contribute a flat amount, just send a check to PO Box 154, Cape May Point, NJ 08212. 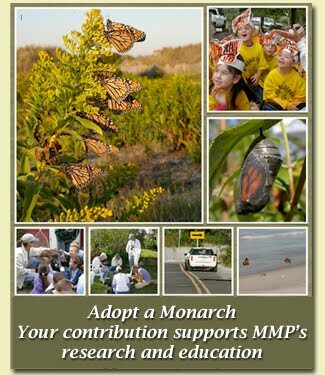 Write the check payable to "NJ Audubon Society" and in the "memo" are write "Monarch Project #024." You can see more pictures about this event at this page. Monarchists checking Pond Creek Marsh just before sunset.